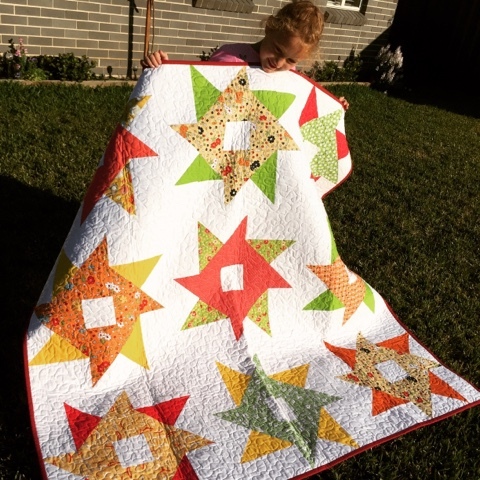 My Whirligigs and Pinwheels quilt is back home from the publishers. It's made with big 18" blocks and comes together very quickly. My little assistant took some time out of her busy trampoline-jumping schedule to help me get a photo. The Whirligigs and Pinwheels project is published in the current issue of Patchwork & Stitching Magazine. Bronchitis. Oh my goodness, I haven't had it this bad since I was a child. In between falling asleep on the couch, I've been doing a little bit of hand sewing while watching Suits on Netflix. Have you seen Suits? One of the characters is called Harvey Spectre. If George Clooney and Michael Bublè had a love-child, he would look a lot like Harvey. This hexie project is by Sue Daley and is a sew-along on her blog. I'm a little behind, but hoping to catch up while I hold down the couch. 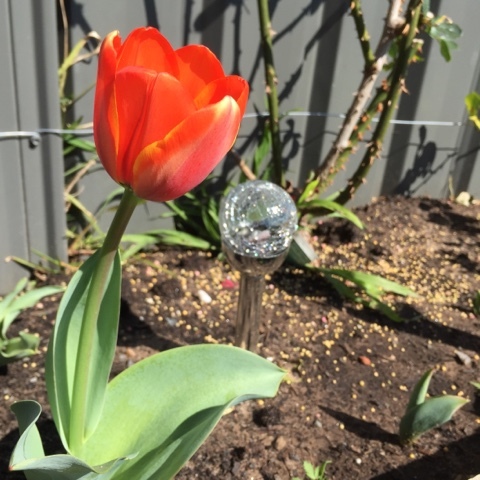 The first day of spring brought with it our first tulip bloom. Isn't she a beauty? It's our local show this weekend and FlyBoy will enter it in the flower section. Fingers crossed it wins a prize. I've entered a number of quilts/cushions into the needlework section of the show. We drop everything off to the show pavilion tomorrow morning for, judging at midday. We see our results on Saturday Show Day. Fingers crossed for a prize or two. I'll certainly let you know how I go. Your quilt is wonderful as is your beautiful daughter! So sorry that you have bronchitis, try and get as much rest as you can and feel better soon. 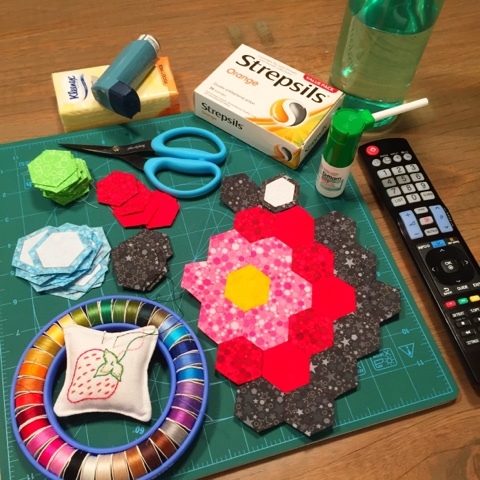 Looks like a fun Hexie project, have fun with it. So many Hexie quilts are so beautiful and have such character, but I have never tried one and am not sure I really want to. LOL. Best of Luck for your entries, love your tulip. Fall is coming quickly here and most of my flowers are beginning to die off, so it is refreshing to see flowers in bloom from elsewhere in the world. Thank you for sharing and have a wonderful creative day! Love the quilt. sorry you're sick! I realize I'm an old woman but it still amazes me that we can communicate halfway around the world in a flash! when you talk of spring and a flower, we're looking at waning sunlight hours and fall on the way! Interesting looking box: strepsils? Wonder if we have those here? Such a beautiful quilt! 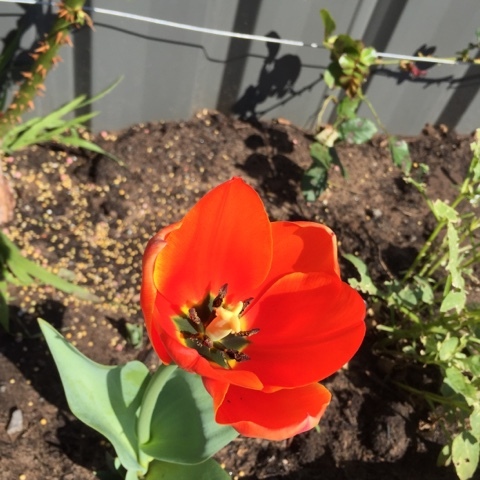 It's nice to see flowers growing in the Spring, we are heading into Fall and some leaves are already changing and the garden is starting to go to sleep. Luv your new quilt pattern. Get well quickly is my prayer for you. Love the spring tulips as we are heading into fall.